This is a t shirt design I did for the Nijmegen team at CFB Winnipeg. The team is training for a four day march in Nijmegen in the Netherlands, and will be doing 40km per day, totalling 160 km. I had to drop out of the trainnig because of scheduling conflicts unfortunately, but I'm still working on the design (mostly so I can get a shirt!). Check out the March's website for more information. Canada has been participating in the March since 1953, so I wanted a vintage feel for the design. 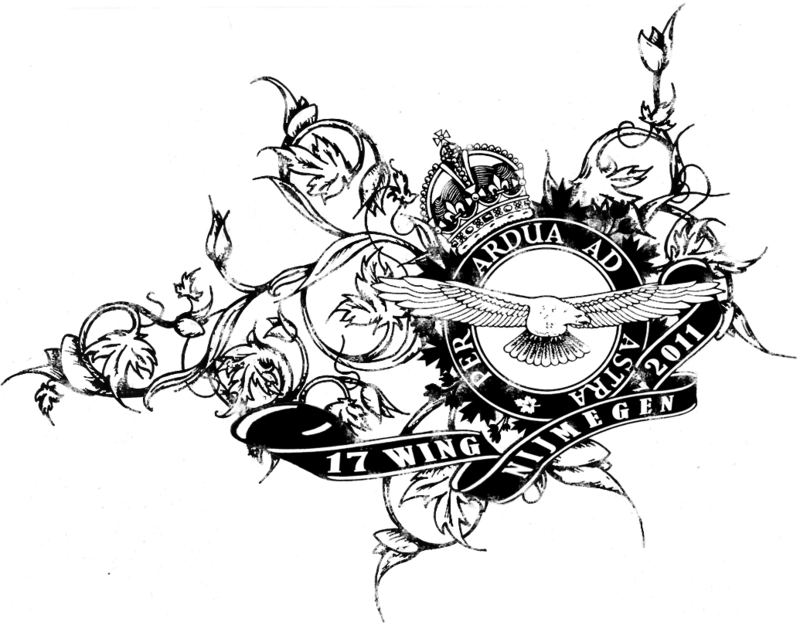 I started with the old RCAF crest and manipulated the orientation and banner, and changed the wording to reflect the occasion. I took the maple leaves that were around the roundel and alternated them with tulips to represent the Netherlands, and after that drew in all the swirls, which are loaded with more maple leaves and tulips. I used the wartime crest with George's crown to keep with the vintage feel, but we're switching it to Elizabeth's for the final print. I'm going to find somewhere to print it now, in white ink on Air Force Blue or maybe brown.